In 2007/2008, 31.0% of Inuit children aged three to five years living in Nunavut communities were moderately food insecure and 25.1% were severely food insecure. That means that in total, 56.1% – or more than half of the children – were food insecure. Rates of food insecurity are highest among Inuit in Inuit Nunangat, at rates almost double that of the national average.1 While, parents and caregivers will often sacrifice meals for themselves to provide for their children, rates of food insecurity are nevertheless very high for Inuit children. 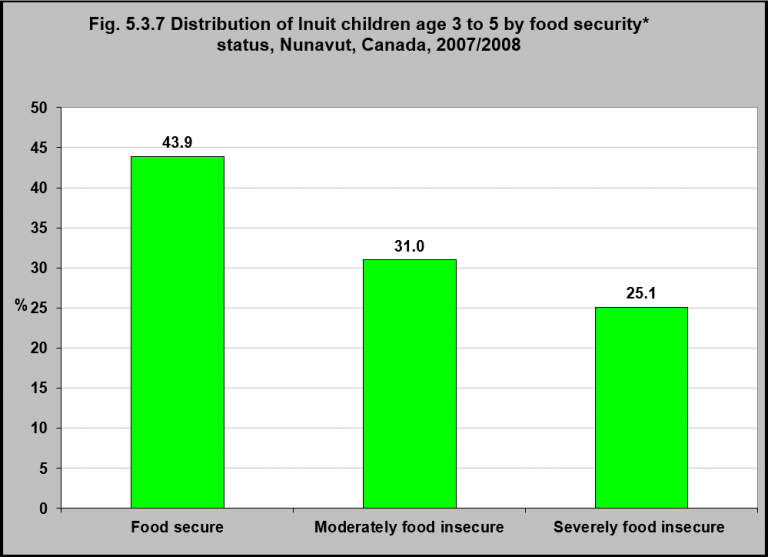 Food insecurity has physiological and nutritional consequences experienced from the early stages of life right through the life course, including anemia, obesity, slower growth rates, and learning and behavioral impacts that will extend into Inuit children’s lives and affect future education.2 The consequences of this will be experienced not only by the individual, but by the entire community. 1Rotem, T. (2016). Beyond hunger: Malnutrition and Inuit children. Feeding Nunavut. http://www.feedingnunavut.com/beyond-hunger-malnutrition-and-inuit-children/ -accessed August 23, 2017. 2See for example, Pirkle, C.M., Lucas, M., Dallaire, R., Ayotte, P., Jacobson, J.L., Jacobson, S.W., Dewailly, E., & Muckle, G. (2014). Food insecurity and nutritional biomarkers in relation to stature in Inuit children from Nunavik. Canadian Journal of Public Health, 105(4), e233-8; Rotem, 2016; and Expert Panel on the State of Knowledge of Food Security in Northern Canada. (2014). Aboriginal food security in northern Canada: An assessment of the state of knowledge. Ottawa, ON: The Council of Canadian Academies. http://www.scienceadvice.ca/uploads/eng/assessments%20and%20publications%20and%20news%20releases/food%20security/foodsecurity_fullreporten.pdf -accessed September 12, 2017.